Throughout the years we have seen our fair share of interestingly questionable supplement companies. Its inevitable, really. But Prime Labs (clone of Invictus Labs), takes the cake. It all started for us when we decided to purchase the highest rated test booster on Amazon, which was Prime Test. At the time of this review, Prime Test had over 17,000 reviews on Amazon, with most being positive. For about $19 we decided, why not? 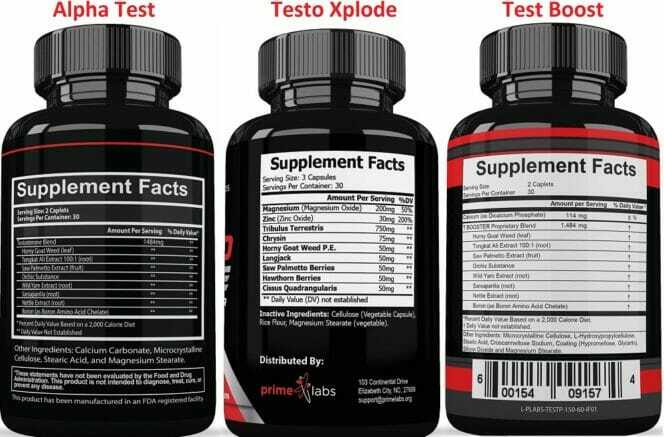 Prime Labs makes 3 test boosters: Prime Test, Testo Xplode and Test Boost. Interestingly, Prime test ($19) and Test Boost ($9) contain the EXACT same formula. Prime Labs used to be Invictus Labs which is still in business. They make 2 additional EXACT clones of Prime Labs, all at different price points. Basically: when you purchase a test booster from amazon, and at the bottom you see multiple options – they are all the SAME girl in DIFFERENT dresses. So, the marketing is pretty evil and manipulative… Does it get worse? Who is Prime Labs… Or Invictus Labs? We wanted more details on what’s going on here, so we began digging deeper. On both the Prime Labs and Invictus Labs website, there really isn’t any contact information, manufacturing information, or, even worse – legit business location. All they have is an email for an individual named Taylor. Where is Prime Labs Located? On their website, there is no address. On our bottle, the address is simply: Bloomington, IN 47401. Yep, no street address… Just a city and state. But on their image mocks for Testo Xplode we DO have a full address: 103 Continental Drive, Elizabeth City, NC 27909. This address is for some town house, not an office location. Shady. Where is Invictus Labs Located? To very little surprise, same story here. This time, we do have an address on the website. It is: Albilene, TX 79605. Again, no actual street address. However, on their Trademark registration for Invictus Labs, we have: Lewes, DE 19958. Are we the only ones getting mad here? Bottom Line: Prime Labs is Invictus Labs, their supplements are near-identical for different price tags, with several clones, and they do not disclose their ownership or location. Image of Prime Labs test boosters, Invictus clones not included here. Corporate Shadiness aside, what’s the deal with their test boosters? Despite using the near-same formula for 4 different products at different prices… Is the formula any good? The Prime Labs Prime Test formula is a proprietary blend, meaning we do not know the exact amounts of each individual ingredient. All that we know, is that the listed ingredients all add up to the prop blend total weight. Horny goat weed extract: While horny goat weed (HGW) is included in many testosterone boosting supplements, research suggests that it may only be effective as an aphrodisiac and erection enhancer (1). Its use in testosterone stimulation is in the trivial category (2). Tongkat ali extract 100:1: While HGW is a clearly questionable test booster, Tongkat ali may have more going for it. There are studies suggesting that it can raise test levels in hypogonadal men (1). This is especially prevalent in stressed males, where Tongkat may help shield the body from stress and protect hormonal balance (3). Both studies used 200 mg per day, we do not know if Prime Test contains this dosage. Saw palmetto extract: We are quite familiar with saw palmetto. While it was once questioned for testosterone raising capabilities, it has later been found to actually block androgens. This is why men with enlarged prostates choose to supplement with saw palmetto to improve urinary flow. Orchic substance: Bet you have no idea what this ingredient is, do you? Well, orchic substance is basically, ground up testicles. Where does it come from? Who knows, mate. Does orchic substance work, probably not (4)? Wild yam extract: Wild Yam is actually an estrogenic compound, not a testosterone boosting compound (5). Yikes! Sarsaparilla: May help restore testosterone balance in low-testosterone men (6). Nettle extract: Like saw palmetto, nettle is often taken to block androgens. Boron amino acid chelate: Boron has been studied for its potential testosterone normalizing abilities. This is a good addition to any test booster. Verdict on the formula: While a few of the ingredients have some clinical bearing, they compete with several other non-validated ingredients for a 1,484 mg total dosage. It is quite unlikely that the key ingredients are in quantities required to have any effect at all, which is precisely why exact dosages are hidden. On the Prime Labs website, Prime Test is advertised in a blog post to have the sole purpose of raising testosterone while burning fat. Though, later in the post, apparently Prime Test is also apparently better for everything else… As repetitively summarized in a poor English segmented by sentences beginning with “Prime Test is additionally”. Our team took Prime Test as directed for a total of 30 days. Despite none of our members having low testosterone, we all are always seeking to increase what we have. During the review period, we continued are daily lives just as we have in the past: 3 heavy gym days a week, with 5 days a week active recovery overlapping training days. Active recovery consisted of walking/running 4 miles per day. At the end of our 30 days, zero team members reported noticeable effects of any sort. This isn’t the first time a test booster that we’ve reviewed showed zero results. However, there are also quite a few test boosters that produce noticeable results. Our consensus is that we will not tell you to not buy this product, if you want to try it… But we will not be ever taking it again, or its clone products. We didn’t experience any effects during our 30 day Prime Test review. While there are a LOT of things we dislike about Prime Labs (Invictus), such as their duplicate products, duplicate companies, lack of transparency or business address… It isn’t uncommon for test boosters to have zero effect, as, most of them are garbage. But again, not all are garbage – which is why we review them! Opinion Disclaimer: This article is the personal opinion of the staff at BWSB, published on our own website. We have not distributed or promoted this content to any other website, social media, or news source. The information provided is our best judgement, and may not be completely accurate. To the owners of Prime Labs (Invictus), tell us where we’re wrong if we are, and we’ll go from there. But any legal notices are not warranted or welcome.